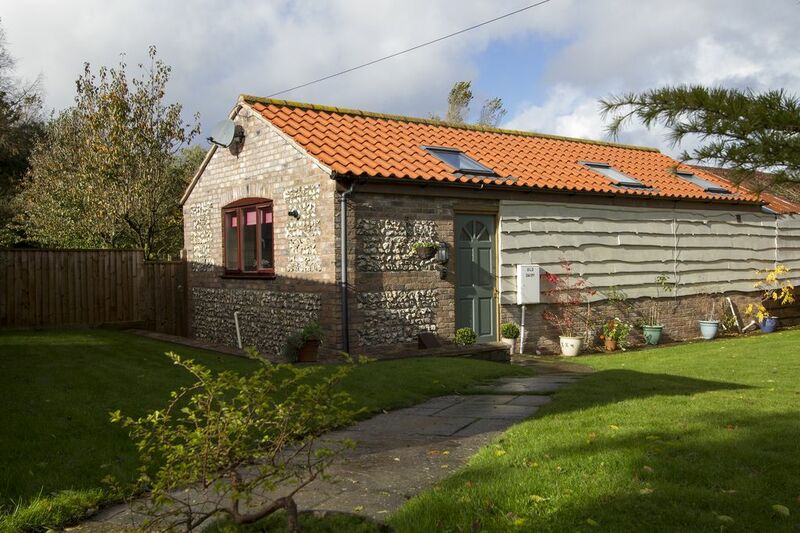 Old Dairy is set in the heart of the countryside in a hamlet, amongst six other cottages, with an abundance of wildlife, making an ideal holiday cottage for two. Light and airy, with an abundance of beams, Old Dairy is a lovely barn conversion, with an fully fitted kitchen, open plan lounge/dining area, large patio windows onto private garden, modern bathroom neighbouring double bedroom with kingsize bed, exposed beams, wardrobe. Kitchen, gas hob, electric oven, fridge, ice box, dishwasher, washing machine and microwave. Open plan lounge with TV, dvd, freesat, iPod dock, Stereo, independant wifi, dining table/chairs, bathroom, shower cubicle, WC, totally enclosed garden, large patio with private lawned area. Furniture, rotary clothes dryer, Gas central heating, parking for one car, Bed linen/towels provided. One/two small/medium well behaved dogs welcome. We are a local family, having lived just outside of Swanage for many years so have an excellent knowledge of the area and local facilities. We now live in a neighbouring cottage to Old Dairy, where we are enjoying the wonderful wildlife and countryside surrounding us. Stepping inside Old Dairy, this property envelopes you with a wonderful feeling of privacy, but spacious both inside and out. Although set in the heart of countryside, the location is ideal with the coast 3 miles away, set on the Jurassic coast, and a village just a mile away, with ample shops and a mainline station, but near to all Dorsets attractions. Old Dairy is approached by a tree lined drive, which is a wonderful habitat to pheasants, ducks, deer and many species of birds. There is a pretty garden adjacent to facilites for car parking, and a barn that used to be home for dairy cattle, but now home to owls and our pet ponies. The whole area is surrounded by fields, with a wonderful feeling of open space. Walk-in shower cubicle, wash-hand basin, wc, towel rail, shelves, radiator, light and airy, non-slip floor surface. Full radiator gas central heating. Duvet, bed sheets, pillows, pillow cases. Extra blanket. Parking for one car adjacent to property, arrangements for extra vehicle possible. Bathroom towels, kitchen tea towels. Under worktop refrigerator with freezer compartment. Four ring stainless steel gas hob. Electric fan oven with built in timer,clock, etc. Full itinerary of crockery, cutlery, saucepans, frying pan, bakeware, serving dishes etc. Coffee, tea, sugar containers. Circular dining table with two chairs. Pure Hi-fi unit. i-Pod dock. Selection of books, including local history and art. There is small selection of dvd's. A lovely private rear garden, totally enclosed, comprising patio area, and raised lawn area, overlooking open field and trees. There is a totally private patio area adjacent to the patio doors, with outside furniture and ample seating. Had a lovely 4 night break at The Old Dairy, accommodation very comfy, good facilities and our dog loved the garden, which was safe for him to run around in. It was also a sheltered spot for us, the weary walkers, to sit in the afternoon and watch the sun go down. The Owners were friendly and we appreciated the lovely box of biscuits left for our arrival. We hope to return again for another relaxing break. Lovely comfy bed and douvet. Enclosed garden great for the dogs. Welcome treat from owners made us smile. We stayed over the Christmas period for 8 nights and couldn't have been happier. Lynne decorated the beams for us and put up a lovely Christmas tree and left us a very welcome bottle of wine and Bisuits along with the essentials. Spotlessly clean, cosy and warm and felt like home from home. Very comfy bed and powerful shower. The enclosed back garden was brilliant for our dog. Location is ideal for Lulworth Cove, Durdle Door and the rest of the Dorset coast. The nearby local pubs are also welcoming with good food and are dog friendly. We will definitely be back. Roger and Kim Lammin. Lovely, welcoming place to stay. Was just perfect for an early winter visit to Dorset. The property was great, very cosy. The enclosed garden was perfect for our dog. The Old Dairy is also near Durdle Door, Bovington Tank Museum. Wareham with the River Frome and Quay are a short drive away. Swanage and Corfe Castle are less than a 30 minute drive, and Weymouth aprroximately the same. We have many National Trust properties within a short drive, and the RSPB reserve at Arne, Wareham.